Will the Military Use Force against the Protesters? The military’s decision to depose Bashir appears to be based on a miscalculation that the protesters’ ire was primarily directed at the long-time ruler. In fact, protesters have been nearly unanimous in saying that they want to see a real change to the political system and an end to military government. Protesters are demanding civilian control and a say for citizens in shaping governmental decisions that affect people’s day-to-day lives. In its announcement installing the Military Council as the transitional authority, the military leadership declared a curfew from 10 pm to 4 am (which was later rescinded). Seeing the Military Council as simply replacing one autocratic leader with another, the protesters have defied the curfew and remain camped outside the Defense Ministry headquarters. The military will have to decide whether to remove the protesters by force or seek some form of compromise. While the military certainly has the capability to move against the protesters, there are a number of reasons that should give them pause in doing so. Using force would permanently alienate the population against the military leadership. Currently, while there is a high level of distrust towards the military, there is a recognition that the armed forces have shown restraint since the protests began in December. While some elements of the security sector, notably the Rapid Support Forces and intelligence services, have attacked protesters resulting in dozens of deaths and hundreds of injuries, the military has given protesters considerable space. Moreover, in some instances, elements of the military have defended the protesters against those using force. This highlights another key consideration for military leaders. The Sudanese security sector—military units, police, and intelligence—is highly fragmented. It is not at all clear that they would all go along with a violent response to the protests, creating the possibility of factional fighting on the streets of Khartoum. This would be a paradoxical outcome to what has been a determinedly non-violent movement. Military leaders should also know that the underlying economic forces that have led to the rapidly rising inflation and increasingly difficult living conditions are not going away with Bashir’s removal. Sudan faces $55 billion in foreign debt and high unemployment. The military will need to consider that it requires public support and the expertise of the civilian professionals to help stabilize the economy. Access to significant international support will depend on having a credible economic team in place that is part of a viable political transition. Can Protesters Stay Organized and Sustain Their Movement? The protests in Sudan have been remarkable for their organization, restraint, non-violence, and national pride. They have been led by middle-class professionals, students, women, and interfaith leaders who are articulating a different vision for political life in Sudan. They have been joined by Sudanese from all walks of life and across dozens of towns and cities. This has provided the protests tremendous public credibility. Achieving a successful outcome requires sustaining the reforms over time. A lesson from other democratic transitions, as well as previous brief civilian transitions in Sudan in 1964 and 1985, is that achieving a successful outcome requires sustaining the reforms over time. Building a democracy is far more involved than removing an autocratic leader, as significant as that is. Rather, genuine change will require institutional reforms—creating checks on the presidency, a representative legislature, a free press, an independent judicial system, a merit-based civil service, a professional and depoliticized security sector, an apolitical central bank, oversight mechanisms to curb corruption, and a process for ensuring free and fair elections, among others. Making these changes takes time and requires clearly articulated goals. Moreover, there will be attempts all along the way for rearguard actors to derail the process. Maintaining momentum (and pressure) for these reforms, therefore, is vital. This will require the protest leaders to organize for the medium-term while dealing with the day-to-day tactical challenges they face. The more inclusive and cross-cutting this reform coalition can be, including with members of the security services, the more robust and sustainable it will be. The Sudanese protesters have made an exemplary start. And even though Sudan has had an authoritarian system for many years, Sudan benefits from a rich civil society tradition that has sustained the vision of a democratic society. A history of opposition parties, academic institutions, media outlets, neighborhood groups, and a strong sense of national pride provide Sudan fertile ground to create the cross-cutting social networks needed to sustain the reform movement in the coming months and years. What Would a Civilian-Led Transitional Process Look Like? Should a civilian-led transition emerge, what should this process entail? Lessons from other transitional arrangements highlight the importance of creating an apolitical transitional body to build as broad a base of support for the transition process as possible. The direction taken by the Sudanese Professional Association in leading the protests certainly provides a good starting point. One means of reinforcing this apolitical posture of a transitional government is to require that any member of its leadership not compete for political office in the subsequent election. Time should be taken to reform the key institutions that can ensure there is a level playing field after years of one-party military rule. Establishing a clear mandate for the transitional government will be vital. Societies transitioning from years of authoritarianism cannot simply hold elections for a new leadership. Rushing forward on such an action is a recipe for disaster. Instead, time should be taken to reform the key institutions that can ensure there is a level playing field after years of one-party military rule. Once some of those basic reforms have been put in place, then the likelihood increases that elections will lead to an outcome seen as legitimate and acceptable to a broad majority of the population. Some considerations for participation in a transitional leadership would be representation from a broad swath of interests and geographic regions. Individuals with strong moral authority across the country would also provide credibility and national cohesion to the process. Composition should also prioritize those with technical expertise as they will be guiding the institutional reform process and should be empowered to do so on a merit-based rationale. While no transitional arrangement will be perfect, establishing some of these guidelines should help. Transitional experiences in Burkina Faso, Gambia, Liberia, South Africa, Kenya, and Burundi, as well as outside of Africa, hold some valuable lessons in this regard. What Role Will External Actors Play? Given its strategic location and ties to both Africa and the Arab World, many external actors may have an interest in trying to tilt the outcome of the Sudan transition. Complicating these considerations is that Bashir has overseen regularly shifting relationships with key neighbors, including Egypt, Ethiopia, Saudi Arabia, the United Arab Emirates, Qatar, and Turkey among others. It is perhaps understandable, then, that it does not appear that any regional actors are calling for the restoration of Bashir. The most immediate concern is that an external actor interested in maintaining the status quo or enhancing its strategic posture may intervene to try and prop up the Military Council and perhaps provide it the rationale to use force against the protesters. China’s interests in Sudan have recently been upgraded given its position on China’s 21st century Maritime Silk Road. 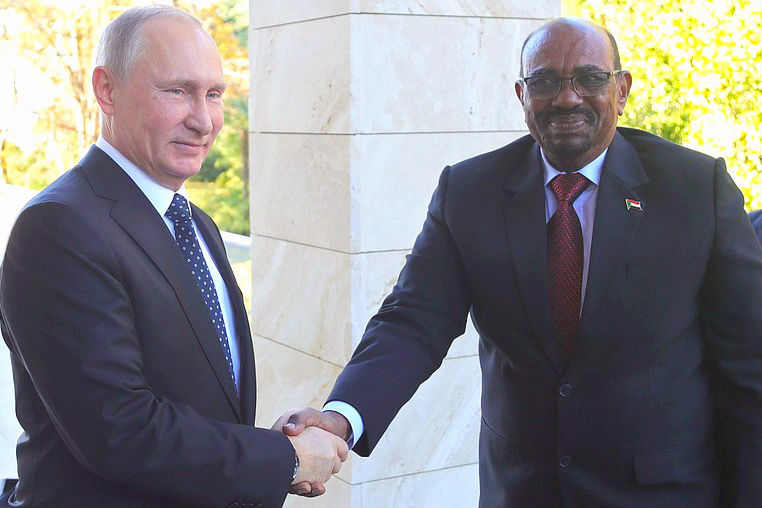 Russia has been showing increased interest in Sudan in recent years as part of its new push into Africa. Consequently, these actors may see value in stymieing a democratic transition. Should a transitional civilian government emerge, there is also the question of how quickly international financial institutions and Western donors would be able to step in and help stabilize the economy. Doing so will be necessary if Sudanese reformers are to have the space needed to sustain the transition. A lagging economy, persistently high unemployment, and perceptions that nothing has changed are common reasons for democratic transitions to stall (and rearguard elements to stir up nostalgia for an earlier era). How Will Islamist Groups Align with the Reform Movement? A notable aspect of the protest movement is the degree to which it has been led by inter-faith, middle class professionals. Many protesters are women. Before he was deposed, Bashir had broken with the hard-line Islamists in his National Congress Party, indicating the waning influence of political Islam. This turnabout comes after decades of expanding fundamentalist influence within official Sudanese institutions. How this social dynamic plays out in the transition will be another important factor to monitor, especially to the degree these changes harken back to a more moderate and tolerant interpretation of Islam in public life long associated with Sudan prior to Bashir’s taking power 30 years ago. Luka Kuol, “Sudan’s Shifting Calculus of Power,” Spotlight, Africa Center for Strategic Studies, March 11, 2019. Joseph Siegle, “An Overview of Africa’s 2019 Elections,” Spotlight, Africa Center for Strategic Studies, January 31, 2019. Africa Center for Strategic Studies, “Understanding the Significance of the Protests in Sudan,” Spotlight, Africa Center for Strategic Studies, January 28, 2019. Africa Center for Strategic Studies, “Term Limits for African Leaders Linked to Stability,” Infographic, Africa Center for Strategic Studies, February 23, 2018. Joseph Siegle et. al., “Africa and the Arab Spring: A New Era of Democratic Expectations,” Africa Center Special Report No. 1, November 30, 2011.